A number of books analyse and critically discuss the impact of the 1910 and 2010 conferences. The Regnum Edinburgh 2010 (Centenary) Series includes about 30 volumes of collaborative work from around the world related to Edinburgh 2010 themes. To see details and to order at discount rates, see http://www.ocms.ac.uk/regnum/edinburgh2010. We also recommend the following publications on mission related topics. Regnum Books International is publishing a major mission studies series arising from Edinburgh 2010. The Regnum Edinburgh 2010 (Centenary) Series contains more than 25 projected volumes which reflect the ethos of Edinburgh 2010 and will make a significant contribution to ongoing studies in mission. The series includes the preparatory volume for the conference and the conference report. For the latest volumes available click on the Regnum Edinburgh 2010 series on the Regnum Books International website here. Download a brochure (2011) here. The books in the series are available for purchase from Regnum Books International and from Amazon and other book-selling websites. Many volumes are being co-published on different continents and they are available in many countries through local distributors. Twenty libraries worldwide have been selected as repositories for the complete series. Though the outcomes of the 1910 World Missionary Conference have differed in many ways from the expectations of its participants, after a century its momentous significance is clearer than ever. While the missionary movement went into decline, from its work emerged a world church, with deep roots and vigorous expression on every continent. As the centeneray of the Conference approaches, the time is ripe to examine its meaning in light of the past century and the questions facing Christian witness today. This book is the first to systematically examine the eight Commissions which reported to Edinburgh 1910 and gave the conference much of its substance and enduring value. It will deepen and extend the reflection being stimulated by the upcoming centenary and will kindle the missionary imagination for 2010 and beyond. For further information please visit the publisher's website or Amazon.co.uk. The book was co-published by WCIU Press and is now available to a North American audience on Amazon.com. The Edinburgh 2010 study process is unique. Set up to mark the centenary of the 1910 World Missionary Conference, it is a project of churches worldwide which is multi-regional, cross-denominational and poly-centric. It involves all the major Christian world bodies, including Catholic, Orthodox, Protestant, Evangelical and Pentecostal, with study events taking place in every continent that involve hundreds of Christians in different parts of the world. This volume, the second in the Edinburgh 2010 series, includes reports of the nine main study groups on different themes which will be used as the raw material for discussions at the conference in June 2010. Their collaborative work brings together perspectives that are as inclusive as possible of contemporary world Christianity and helps readers to grasp what it means to be ‘witnessing to Christ today’. To order Edinburgh 2010: Witnessing to Christ today, please visit the publisher's website or Amazon.co.uk. By kind permission of the publishers, Regnum Books, this book is also available as PDF download. The centenary of the historic and influential World Missionary Conference held in Edinburgh 1910 presented a unique opportunity for the whole church worldwide to come together in celebration, reflection and recommitment to witnessing to Christ today. Edinburgh 2010 also engaged in serious study and reflection on the current state of world mission and the challenges facing all those who seek to witness Christ today. The results of this research was presented and debated within the context of Christian fellowship and worship at the conference in June 2010. This record of that conference is intended to give the background to that Call, to share the spirit of the conference, and to stimulate informed and focused participation in God’s mission in Christ for the world’s salvation. The World Missionary Conference of Edinburgh 1910 was an epoch-making event. Edinburgh 2010: Springboard for Mission provides an overview of the momentous 1910 conference and analyzes the many streams of development in global Christianity which flowed from the first Edinburgh conference. This primer on the importance of Edinburgh 1910 and the forthcoming 2010 conference looks both at the achievements and downfalls of the past as well as pushes the Christian missions movement forward to the future. As Kenneth Ross writes in this volume, "the centenary of Edinburgh 1910 is an occasion which challenges the global missionary movement to re-gather and take stock again of how it stands in relation to its task." The time has come for the missions movement to gain new momentum and definition for the task ahead. Edinburgh 2010 truly has the potential to serve as a new springboard for mission. For more information visit the publisher's website or follow this link. By kind permission of the publishers, William Carey International University Press, this publication is also available for download here. Available in English, French, Spanish and German. The centenary of the 1910 World Missionary Conference has proved to be a suggestive moment for those concerned with the question of how the church of Jesus Christ engages the world in which it is set. Edinburgh 2010 has succeeded in bringing together a broader representation of world Christianity than has ever before been mobilised in a common project. It has been able to draw on the experience and insights of people from every continent. It has also been enriched by the gifts and wisdom of almost every conceivable Christian tradition—from Eastern Orthodox and Roman Catholic to Pentecostal and Independent. This small book offers a bird’s eye view of the results of the study process which has engaged nine key themes in preparation for the historic Edinburgh 2010 conference. It brings into sharp focus the crucial issues facing Christian mission today – in a way which invites both personal refl ection and group discussion. Written in non-technical language and providing pithy accounts of the outcomes of the study process, this book is an ideal place to start for anyone aiming to become familiar with the substance of the discussion being generated by Edinburgh 2010. To order the book, please follow this link. Download New Directions for Church in Mission in French, Spanish and German. The Edinburgh 2010 study process has created a diverse community of discussion and reflection which spans the globe and extends broadly across the full spectrum of church life. At no time or place have all of its participants ever come together. Yet they have found ways to unite and connect – through a website, through email, Skype and Facebook, and through occasional meetings or consultations to address particular issues. The process is therefore informed by possibly a wider range of experience than has ever before been applied to questions of church and mission. From such an extensive web of international interaction this small book has emerged. It revolves around seven “transversal” themes which “run like threads” across all nine of the Edinburgh 2010 study tracks (examined in the companion volume Edinburgh 2010: New Directions for Church in Mission). Each of the seven transversals represents a way of looking at mission, like a set of binoculars which enables you to see things that you might otherwise miss. Working through the chapters, either alone or in a small group, will yield fresh perspectives on the meaning and practice of Christian mission in the world of the 21st century. It has often been said that youth are the future of the Church. While this may be true, it is important to realize that while youth will eventually become the Church of tomorrow, they are also intricately involved in the formation and development of the Church of today. With this in mind, the organizers of the Edinburgh 2010 conference, which commemorates the centenary celebration of the Edinburgh 1910 World Missionary Conference, have included "Youth and Mission" as one of their seven transversal topics to be discussed int he Edinburgh 2010 study process. This book, consisting of a series of essays, provides a look into the various perspectives of youth from around the world, as they engange in the future challenges facing the Church today and the opportunities for the future. The authors of these essays provide new and refreshing approaches to Christian witness within the 21st Century. Kirk C. Sandvig is a Ph.D. student at the University of Edinburgh, New College, Centre for the Study of World Christianity. Since the beginning of 2009, he has served as the Edinburgh 2010 Youth and Mission Coordinator, encouraging youth from around the world to increasingly participate in the Edinburgh 2010 process. Columba Press, Dublin, has published a book by the rector of Newcastle and Church of Ireland Gazette editor, Canon Ian Ellis, marking the centenary of the 1910 World Missionary Conference held in Edinburgh. A Century of Mission and Unity tells the story of the conference and considers its significance for mission itself and as the beginning of the modern ecumenical movement. It then traces a century of mission and ecumenism from Edinburgh 1910 until the present. Canon Ellis was ordained in 1977 and has served in parishes in Armagh and Dromore dioceses. He has pursued biblical and ecumenical studies and is a former President of the Irish Council of Churches and honorary secretary of the General Synod. He is the author of Vision and Reality: A survey of twentieth century Irish inter-church relations (1992). A Century of Mission and Unity is available from usual religious booksellers at £11.50/€12.99, or can be order by email via sales@columba.ie. The Atlas of Global Christianity (AGC), is edited by Todd M. Johnson, Director, Center for the Study of Global Christianity, Gordon-Conwell Theological Seminary and Kenneth R. Ross, Council Secretary, Church of Scotland World Mission Council. Rev. Prof. Ross was one of the key figures in developing Edinburgh 2010, and led the earlier Towards 2010 study process. The Atlas is a visual quick reference of the changing status of global Christianity over the 100 years. It is the first scholarly atlas to depict the 20th century shift of Christianity from the Global North to the Global South. Contextual information on world issues and world religions is included. The atlas is ecumenical in that it covers every Christian tradition including Anglicans, Independents, Marginals, Orthodox, Protestants, and Roman Catholics. For further information please visit the publisher's website. Review by Jean-Paul Heldt. View or download PDF here. in the form of A4/letter pdf documents. A century of mission has occured since the landmark 1910 International World Missionary Conference in Edinburgh Scotland. This conference is arguably the most significant conference in the history of Christianity. The meeting was unique in a number of ways and continues to influence happenings in Church and Christian mission. This conference witnessed the convergence of a number of forces resulting in what is today termed as the "ecumenical movement." For some this is result of the great error of Edinburgh and for others it is the doorway to an updated approach to mission in the contemporary world. There is probably no other single conference which has been, at the same time, vilified, quoted, and esteemed in the history of Church and Mission. This provided a ripe setting for inquiry at the annual Centre for Mission Studies consultation hosted at Union Biblical Seminary, Pune. Out of the presentations and discussions a set of scholarly reflections came which explore the two divergent visions of mission which have developed and continue to prove a cause of tension. We travel back into this historical moment to stand with the Indian representative, V.S. Azariah, and seek an India perspective on how far we have come and have yet to go on the road to mission friendship. Particularly, this conversation was concerned with friendship between Christians with those of different faiths and those Christians who understand mission in very different ways. Frampton F. Fox is a researcher in the field of Intercultural Studies who lives, teaches, and writes in South Asia. The book may be ordered from the publisher or from the Union Biblical Seminary. Please contact bookstore (at) ubs.ac.in. By kind permission of the authors the papers of the consulation can also be downloaded from our website. Since 2006 the French-speaking ecumenical association for mission studies, called "Association Francophone Œcuménique de Missiologie" or AFOM, has been engaged in one of the seven transversal themes of Edinburgh 2010, "Bible and mission - mission in the Bible". The publication Figures bibliques de la mission. Exégèse et théologie de la mission. Approches catholiques et protestantes (Paris, Le Cerf, May 2010, 261 p.), edited by three of the board members of AFOM, is the result of this process. The contributors come from a wide range of backgrounds; they are both Protestant and Catholic, male and female; on an academic level they are historians, biblical scholars or theologians, and come from Switzerland (Macchi, Matthey, Schöni), France (Abadie, Cuvillier, Paya, Robert, Vialle, Zorn) and Cameroon (Djomhoué, Poucouta). The book is divided into three parts: (1) God’s plan of salvation, (2) main figures and (3) receptions in the communities. The authors’ choice is to start with the Bible itself rather than with the missiological context. They explore the Old and the New Testament, giving attention to some biblical figures, characters (Esther, Judith, Paul, the Samaritan woman), stories (the Macedonian’s call in the Acts), discourses (the missionary discourse in Matthew), or themes (benediction, mission of Israel, mission and healing, otherness). But this very choice reveals certain priorities, which can encounter, deepen or alter those of contemporary missiologists. To order the book go to the AFOM website or follow this link. Theological education is vital for the future of World Christianity—this conviction lies at the heart of this publication. Theological education has the potential to be the seedbed for the renewal of churches, their ministries, mission, and commitment to Christian unity. If theological education is neglected by church leaders or in funding, the consequences are far reaching; they might not be visible immediately, but they will certainly become manifest over time in the theological competence of church leadership, the holistic nature of mission, and the capacities for ecumenical and interfaith dialogue and the interaction between church and society. Investment in theological education is investment of hope in the future and mission of World Christianity. The transmission of Christian memory, the education for God’s peace and justice, and the formation for church and community leadership therefore should be priorities in all churches; however, in many places theological education is far from secure or even in crisis at the present time. missiologists, theologians, biblical scholars, church historians, and other scholars interested in global developments in theological education. For more information download the event flyer, or visit the publisher's website. An international and interdenominational team of authors is looking at the history and reception of the World Missionary Conference, held in Edinburgh in 1910. Many of the questions asked at the first Edinburgh conference, are still relevant today, even if the world has changed dramatically in the last 100 years. Edition 13 of Histoire & Missions Chrétiennes was published in the preparation of the Edinburgh 2010 conference. Among others it includes papers of Anne-Marie Kool, Kenneth R. Ross, Jacques Matthey, and Brian Stanely. Available in French only. For more information visit the publisher's website. The Mission Yearbook for Prayer & Study is a daily devotional with 365 inspiring mission stories that come from next door and all across the globe. It inspires thousands of Presbyterians daily as they uphold the mission of the Presbyterian Church (U.S.A.) in intercessory prayer. The stories for the 2010 Mission Yearbook were collected around John 7:38, "Out of the believer's heart shall flow rivers of living water." Each yearbook page bears witness to the abundant possibilities of the church because of the living water within its people. A 16-page colour insert to the Mission Yearbook - 'The Year 2010: Two Anniversaries in the History of American Protestant Missions' - is available as free download from the Presbyterian Church (U.S.A.) website. The World Missionary Conference in 1910 was a defining event in the history of world missions. Brian Stanley here presents his careful research revealing the compelling story of this turbluent, influential gathering in Edinburgh. This book is both an account of the conference itself and an examination of the Protestant missionary movement as it neared the apex of its size and influence. The World Missionary Conference: Edinburgh 1910 is an engaging summation of, in Stanley's own words, "the many-sided legacy of the Edinburgh conference, not simply for the history of the ecumenical movement but also for Christian missions and the wider field of Christian discourse on questions of race and culture." Brian Stanley is Professor of World Christianity and Director of the Centre for the Study of World Christianity, at the University of Edinburgh, School of Divinity. For further information please visit the publisher's website. Review by Jean-Paul Heldt. View or download MSWord file here. Review by Aaron Hollander, first published by One in Christ. View or download PDF file here. "Wege nach Edinburgh - Standortbestimmungen im Dialog mit der ersten Weltmissionskonfereny 1910" wants to contribute to the creation of new perspectives on mission in the 21st century. The papers emerged from a two-year study process under the auspices of EMW (Association of Protestant Churches and Missions in Germany), and deal with topics such as mission and power. 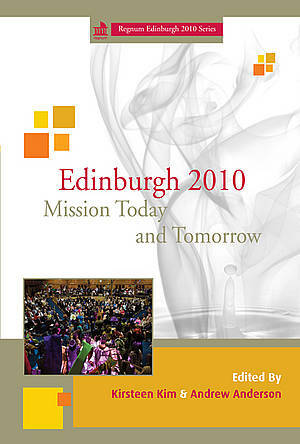 The publication also includes statements on general issues in mission theology in the Edinburgh context. The publication can be ordered for 4 Euros from the EMW website.